Traditional Texas spicy sausage smoked up to 1 hour. Perfect for sharing! A portion of all Smoked Meats plus Sliced Turkey Breast, Memphis Ribs, and all Premium Brisket. Premium whole hand-pulled chicken smoked up to 7 hours. Memphis or Spicy. Dry rubbed and smoked up to 3 hrs. Smoked up to 22 hours with the flavors of Texas. Authentic Texas-style hickory smoked brisket up to 22 hours. Award-winning baby back ribs smoked up to 6 hrs. Premium turkey breast, all white meat, smoked up to 4 hours. Choose from 3 options below. Single Taco 2.99. House made creamy cole slaw w/ a touch of vinegar. Fresh cut hand-tossed Kennebec potatoes. Cucumbers, tomatoes, roasted red peppers, Italian dressing, and fresh basil. Smoked up to 1 hour. Signature 4-cheese macaroni topped with crumbled cheese crackers. Classic fresh made pan-baked corn bread. Fresh romaine and iceberg lettuce. Seasoned corn off the cob topped with a spicy lime aioli, cotija cheese, spicy rub and garnished with fresh chives, our version of elotes. Deep fried plain or spicy (w/ jalapenos)… veggies even a meat lover will love. Signature 4-cheese macqroni topped with 1 hour smoked bacon... and bacon makes everything taste better. 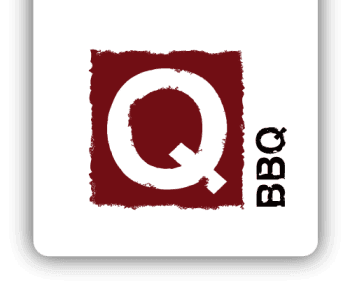 Q’s proprietary BBQ dry rub, mayo, bacon, and green onions. Meat Your Greens! +2.49 / +3.49 Premium. Upgrade and choose from Pulled Chicken, Pulled Pork; Premium: Sliced Turkey Breast, Chopped Brisket, Brisket Burnt Ends, Pork Belly Burnt Ends. Served w/ 1 side & kid's drink. 12 & under.